Feel the gentle breeze of The Summer Wind! In THE SUMMER WIND, Dora’s life couldn’t possibly get any more complicated: with an Aspergian son, a crumbling marriage, and a house that doubles as a virtual money pit, she has plenty on her mind—until she suffers a health scare that makes her rethink her life’s priorities, and allows Dora to find herself again. 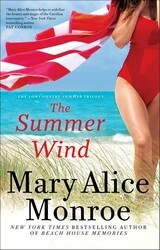 Check out this exclusive sneak peek from THE SUMMER WIND, on-sale today from Gallery Books by New York Times bestselling author Mary Alice Monroe! For a moment, Dora felt almost hopeful. Maybe there was a way they could still work this out, still be a family. They owed it to Nate to try. She was about to utter those words when Cal spoke again, his tone suddenly businesslike and strained, any hint of a remorseful father wiped clean. Dora felt her stomach rise to her throat and a burn blaze across her cheeks. Against her better judgment she’d let her guard down for a moment, thinking he might have changed. And she knew he was about to stomp all over that vulnerability. Now Cal was studying the wineglass as if it held the secrets of the universe. After a moment he folded his hands together on the table and met her gaze. “An amicable divorce?” she repeated, not comprehending the meaning of the phrase. “Yes.” Cal leaned forward slightly and began to speak in a controlled and deliberate voice, as though he’d memorized each word. It frightened her more than if he’d shouted. Cal sat back, slightly insulted. “Right,” he said. Now that Cal had effectively burst her bubble of denial, Dora could listen to his words and hear the veneer he was spreading on thick. Her lawyer blindsiding? It had been just the opposite. “I don’t think so, Cal,” she replied in an even tone. “I heard what you offered today. If that’s your idea of working things out, then you can take your settlement and stick it where the sun don’t shine.” She smiled sweetly. Dora gasped and felt a sharp pain, as though the words had stabbed her heart. She’d always known that deep down he’d blamed her for Nate’s autism. Dora’s heart began pumping hard in her chest and her mouth felt so dry that she couldn’t respond. “I’d better go,” he said. His face pinched and he turned to leave. The louder she yelled, the more withdrawn Cal became. He blew out a plume of air. “I hated my life,” he answered simply. Dora went silent, mouth agape, blindsided. Dora sucked in her breath. More than all the words spoken in the lawyer’s office, more than all the lists on ledgers, this moment told her for certain that her marriage was over. He didn’t love her, had not loved her for some time. Would never love her again. “I . . . I didn’t know you felt that way.” She choked back tears. His words just made her sob harder. She gulped for air, unable to catch her breath. It felt as though he’d taken her heart in his hands and was squeezing it, tighter and tighter. She felt pain under her rib cage and, clutching her chest, she doubled over. “Dora, what’s wrong?” he asked, taking a step toward her. Her heart was pounding so hard she could barely hear him for the thundering in her ears. She staggered forward, her knees buckling. The Summer Wind is the second book in Monroe's Lowcountry Summer trilogy, following the New York Times bestselling The Summer Girls. This series is a poignant and heartwarming story of three half-sisters and their grandmother Mamaw, who is determined to help them rediscover their southern roots and family bonds on Sullivan's Island. It is up to Mamaw to keep the light burning at Sea Breeze to guide the girls through the lies, the threats, and the rocky waters of indecision to home. 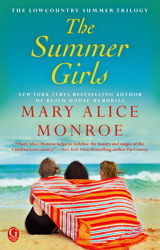 A heartwarming summer read from Mary Alice Monroe about three estranged sisters coming together at their grandmother's home on Sullivan's Island.